How Important are Well Balanced Hooves? If you own a horse or grew up around horses, you have probably heard the saying “No Hoof, No Horse.” Many of us horse lovers take this statement to heart. Without healthy feet, a horse is unable to be a horse. Running, working, riding – all these activities become a chore; a painful chore at that. 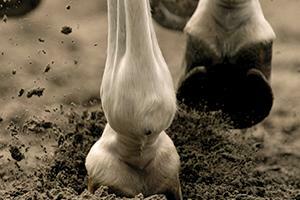 The importance of a healthy hoof is well established, but what about a balanced hoof? Can an imbalanced hoof create hoof related issues? If so, what issues can arise from an imbalanced foot? 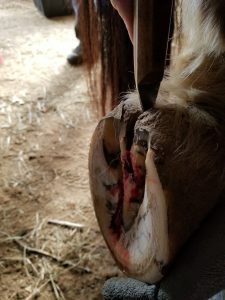 We took the same question to Dave Giza, another professional farrier, and asked him about his experience with imbalanced hooves. “When I trim and shoe a horse, I always pay very close attention to the placement/balance of the heels, how deep the cleft split of the frogs are (the groove/split that starts in the back of the central sulcus of the frog that transitions up the back of the heels and between the heel bulbs), and to the movement of the heel bulbs themselves. If a horse has well balanced feet, with both heels contacting the ground at the same time, there will be very little independent movement of the heel bulbs, frog cleft/split will be shallow, and the horse will be sound. 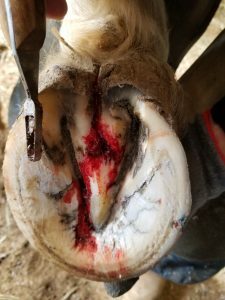 If the trim is out of balance, with the medial side hitting first and then the lateral side or vice versa, there will be independent heel bulb movement and separation that will cause lameness issues. Hoof Imbalance with cleft split starting at the frog central sulcas and splitting up into the hair line. Insertion of narrow blade vet knife into the frog cleft to show depth and separation of heel bulbs. 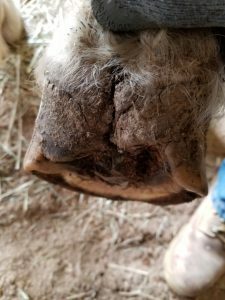 If you look at the hoof from the back and visualize a triangle (the base of the triangle having points at the medial and lateral side of the hoof and the top of the triangle at the apex of the frog cleft), this will present a better picture of what is actually happening. When the base of the triangle hits evenly on the ground, there is no movement at the top of the triangle, just compression as the bulbs move as one unit. However, if the triangle base hits the ground, one side first followed by the other, the top of the cleft will be forced to move from right to left or vice versa. This imbalance will cause tearing and or shearing of the soft tissues between the heels, and deep heel splits that cause the heel bulbs to gap open and allow debris to enter into the cleft gap. Now the stage has been set for infected/swollen sheared heels. 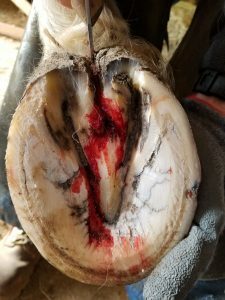 The debris that is lodged deep into the frog cleft becomes Thrush, the constant independent movement of each heel bulb and shearing causes the heel bulbs to become irritated and swell closed, the developing thrush is entrapped, and the result is a very sore heeled, lame horse. Cleaning out debris from frog cleft. Balanced trim with infected central sulcas and frog cleft. Both farriers agree, balanced hooves are important to hoof health. As a farrier, it is extremely important to properly trim and balance each hoof. If this is not done correctly, more issues can arise and create further problems for you down the road. Horse owners must also pay close attention to this detail and do their part in picking and cleaning the feet on a regular basis. If you believe your horse’s hooves are imbalanced, do not be afraid to bring it up to your farrier or to seek the opinion of another farrier or veterinarian. If your horse’s hooves were trimmed improperly, it is important to have this fixed as soon as possible. A hoof supplement combined with a safe anti-microbial hoof clay and liquid will help the hooves recover from cracks, splits or other hoof related issues that arise from the hoof imbalance. Using a hoof supplement will also promote the health of the hoof and increase its growth rate. 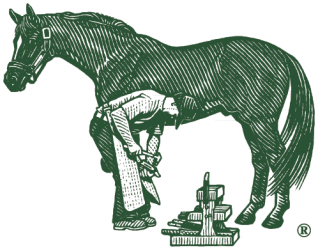 Indian Fields Farrier Service Inc. Previous PostPrevious Hoof Care Doesn’t Stop in the Winter. Next PostNext Does My Horse Need a Joint Supplement?